[ Slave Trade 1805; Thomas Bayly Howell ] The Report from A Committee of the HOuse of Assembly of Jamaica, [...] To Inquire into the Proceedings of The Imperial Parliament of Great Britain and Ireland relative to The Slave Trade, &c &c.
London: Printed and Published according to the Order of the House of Assembly, By Edmund Pusey Lyon, Esquire, Agent for Jamaica. 1805. 40pp., 4to, disbound and defective, foxing, sl. frayed but main text complete, missing title/printed wraps (present as photocopy) with two folding Appendices (Tables) (one missing small section in middle with loss of some letters all the way down): Appendix No. 1. Statistics re. Raw and Refined Sugar up to 1804; No. 2 An Account of the Total Value of the Impor[t] into and Exports from Great Britain in 1801 and 1802, distinguishing the [Brit]ish Manufacturers from the Foreign Ones. INSCRIBED "T.B.H. 'Liscard Hall. | near Egremont | Cheshire.' Undated. 2pp., 4to. Aged and creased, mounted in windowpane on leaf removed from album. Liscard Hall was built for the former Mayor of Liverpool and slave-ship captain Sir John Tobin. Allen writes that since arriving there he has 'painted too little subjects', and that he has 'a wish' to 'leave them behind me - but not unframed - size of Pictures 16in: x 12in:' If Cobbett does not have 'two tolerable frames of that size' he asks him to order two: 'I do not require the "best double distilled - extra hyper - superfine" - but something tolerably good looking'. 8vo: 8 pp. Unbound. Stabbed as issued. Very good, on rough-edged wove paper. 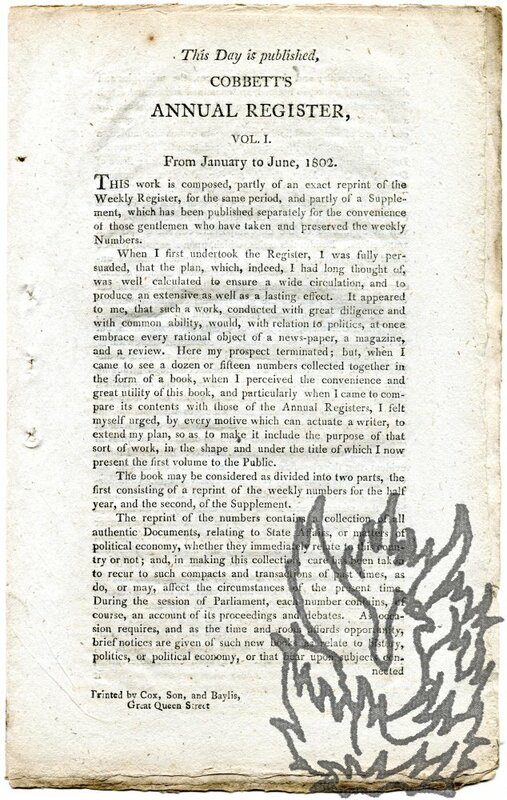 The seven-page advertisement, signed in type by Cobbett, is succeeded by a page headed 'New Books, published by COBBETT and MORGAN'. (Eight titles are listed.) 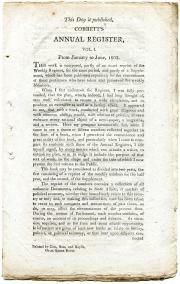 The advertisement is a personal address from Cobbett, the second paragraph casting valuable light on his motives and intentions: 'When I first undertook the Register, I was fully persuaded, that the plan, which, indeed, I had long thought of, was well calculated to ensure a wide circulation, and to produce an extensive as well as a lasting effect.